Growth and revenue are common themes for all companies. Getting all teams onboard to support revenue and business growth goals isn’t a small undertaking. Hence, the rise of revenue operations and roles like Chief Revenue Officer, which exist to bring synergy between revenue-generating teams like marketing and sales. This episode of Revenue Rebels examines the role of revenue operations in advancing marketing and sales alignment and explores the impact of this effort across business teams. 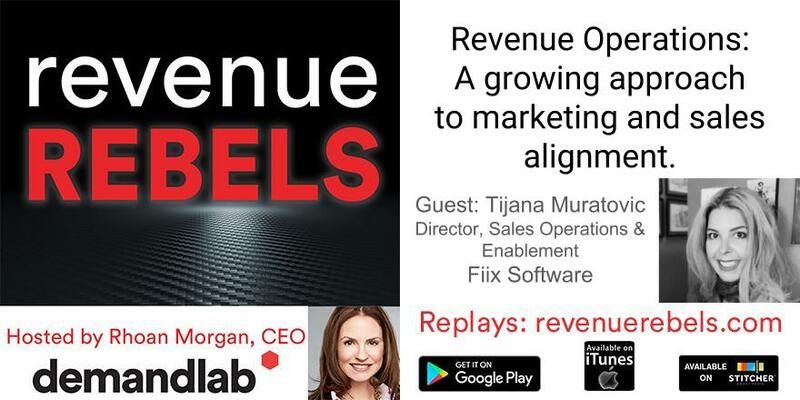 Rhoan Morgan, CEO of DemandLab, talks with Tijana Muratovic, Director, Sales Operations & Enablement at Fiix Software to discuss how the rise of revenue operations is guiding marketing and sales towards true alignment. A true problem-solver at heart, Tijana has a strong history and passion for building revenue functions and teams from scratch. Dedicated to the world of B2B technology, specifically SaaS, her career started on the marketing side of the revenue generation engine. While she always appreciated the creative side of marketing, as a very results-driven individual, she embraced very early on marketing automation and the measurable aspects of marketing. This led her to her first role in Sales Operations and Enablement, an area that has become her true passion. A lifelong learner and also a dedicated mentor, Tijana is one of the founding members of the Sales Enablement Society's Toronto chapter, and a very active contributor to the Revenue Operations Network.